If there is one great fun memory I have from growing up, it’s summer camp! I always loved to head off to summer camp with my friends. 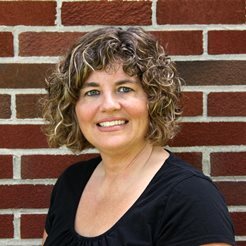 I was even a camp counselor when I got too old to be a camper! Now that I have my own child I want him to share that fun childhood experience. When he was younger we found several different summer camps for him to attend. Of course, the kid’s favorite part is always the snacks! Make sure you pack the snacks in an airtight container to keep critters and bugs away. You’ll also want to make sure you pack plenty of snacks so your child can share! Some of my favorite camp memories are late night snacking sessions and whispering with friends and hiding under the covers so the counselors couldn’t hear us. Girl Scout™ camp was one of my favorite camps growing up! We have a wonderful Girl Scout™ campground not too far from my house, so of course when I think of camp, I think of Girl Scouts. That’s why the Nestlé Crunch Girl Scout™ Candy Bars are so fun! They remind me of going to Girl Scout™ camp when I was growing up. Did I mention Nestlé will donate a minimum of $200,000 to fund camp scholarships? 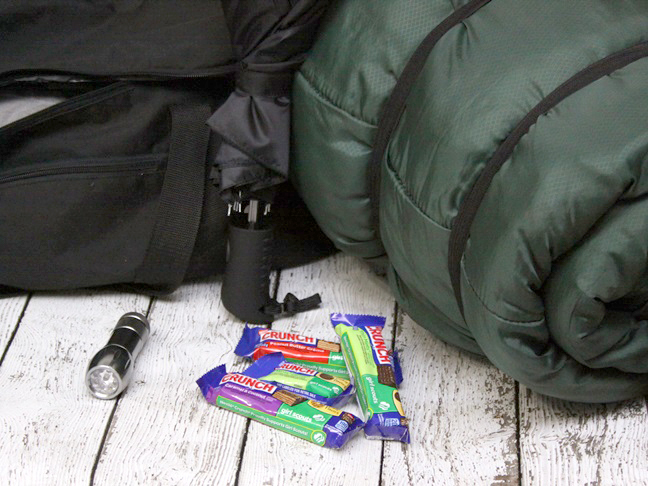 To learn more and join in on the fun, head to nestlecrunch.com/LetsGetHerToCamp. You can help increase the donation to $250,000 and send even more girls to camp by joining the Nestlé Crunch Girl Scout™ Candy Bars virtual campfire. 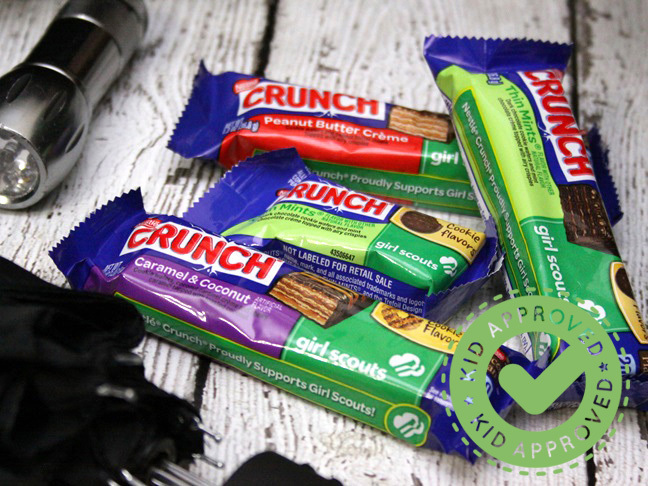 Of course the Nestlé Crunch Girl Scout™ Candy Bars are a perfect snack for kids to take to camp and share with their friends; just make sure your kids don’t leave them out in the hot sun! 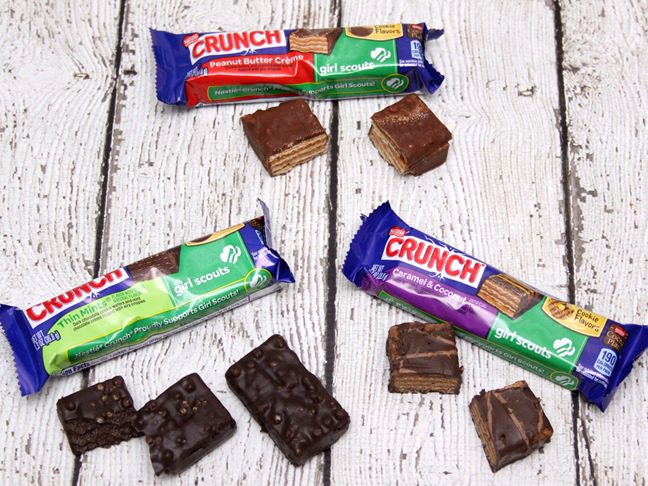 We had the opportunity to test out all three flavors of the Nestlé Crunch Girl Scout™ Candy Bars, including Thin Mints, Caramel & Coconut, and Peanut Butter Crème. All three flavors are modeled after some of our favorite Girl Scout Cookie™ flavors ever! My son and my husband both love Girl Scout Cookies. They each have their own personal favorite candy bar. 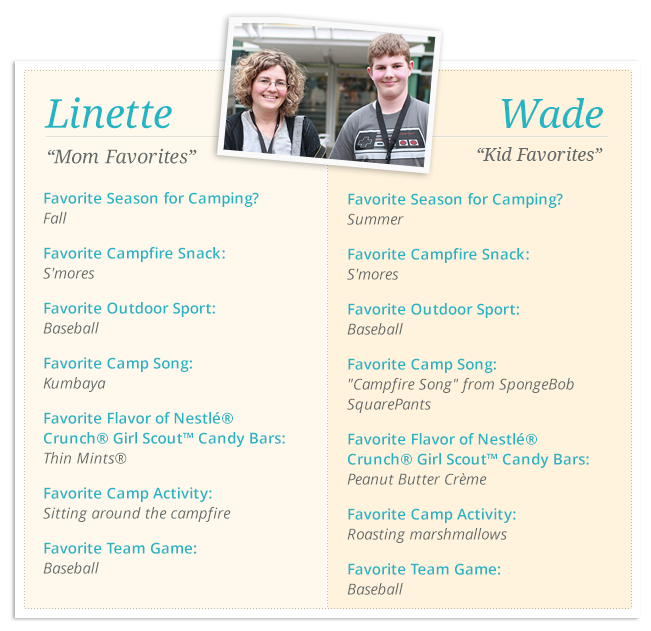 My son loves the Peanut Butter Crème, and my husband is a fan of the Thin Mints Candy Bars. Of course all good things must come to an end, and the Nestlé Crunch Girl Scout™ Candy Bars are only available for a limited time this summer, so get them for your little camper while you can! Have you tried the new Nestlé Crunch Girl Scout™ Candy Bars yet? What’s your favorite Girl Scout Cookie™ flavor? Peanut Butter and Jelly Muffins RecipeHead to the Woods with Something Sweet this Summer!